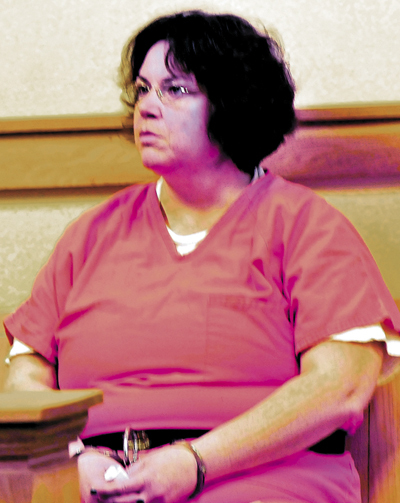 Michele D. Corson, 43, of Skowhegan, charged in connection with the murder of her brother’s former wife in New Hampshire in March, remains held without bail pending review of her case by a grand jury this summer. A Skowhegan woman charged in connection with the New Hampshire murder of her brother’s former wife remains held without bail pending review of her case by a grand jury this summer. Michele D. Corson, 43, waived a probable cause hearing in May and was bound over for grand jury presentment, probably in August, New Hampshire Senior Assistant Attorney General Susan Morrell said Friday. The probable cause hearing could have outlined the facts and circumstances of the charges that set the stage for her arrest on April 18 at her home on Water Street. Corson, a mother of three grown children who managed a consignment shop in Skowhegan, is charged with being an accessory and a co-conspirator in the death of Amanda Warf on March 7. Warf, 36, was the former wife of Corson’s brother, Aaron Desjardins, 36, of Epping, N.H., who is charged with murder. Corson is being held in the Strafford County House of Corrections in Dover, N.H.
“She is in a holding pattern waiting for a grand jury indictment,” Morrell said Friday. Corson’s court-appointed attorney, Andrew Cotrupi, of Hampton, N.H., did not return calls Friday for comment on the case. Corson is charged with taking a gun from Skowhegan to New Hampshire to help her brother commit murder, Morrell said. Morrell said the gun was an automatic .32-caliber German Mauser pistol. She would not say how the gun was used in connection with the homicide. Warf was found dead in an abandoned cement factory in Exeter, N.H., her throat slit. Sarah Desjardins, Aaron Desjardins’ wife, is alleged to have sent the text, according to court documents. Sarah Desjardins is charged with one count of conspiracy to commit murder and one count of conspiracy to commit hindering apprehension or prosecution. Morrell said Corson and Sarah Desjardins are both charged with conspiracy to commit murder, but will have their own individual charges. Whether the cases will be consolidated for trial will be up to the judge, she said. Morrell said once the grand jury gets the case, the charges against the two women could be upgraded. The defendants have yet to enter pleas to the charges against them. “They can’t enter any plea until we indict and get to Superior Court,” Morrell said. The trio will then be separately arraigned in court and trial dates will be set. Aaron Desjardins has denied that he killed Warf. In an interview with the New Hampshire Union Leader two days before his arrest, Desjardins said he was at home with his wife, his sister and his young son when the body was found. Warf is the mother of the young boy. Morrell said Corson’s charge of being an accomplice to first degree murder is the same level of crime as is a felony murder charge in New Hampshire. It is punishable by life in prison without parole. The conspiracy charge is also a felony, punishable in New Hampshire by 15 to 30 years in prison, Morrell said.